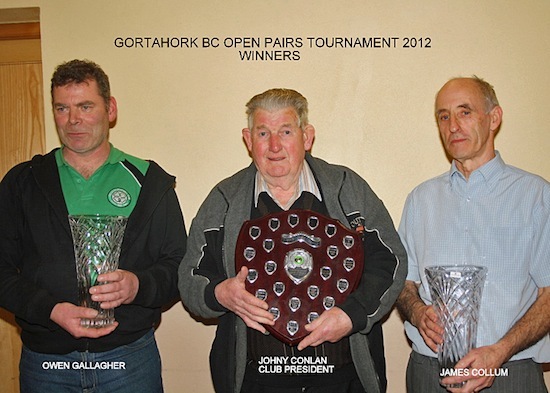 Local knowledge played a big part in Gortahork’s James Collum and Owen Gallagher’s victory in the local clubs pairs tournament. The pair played exceptional bowls during the Finals Night, with Owen only sealing victory with his final bowl of the evening. Runners up were the St Johnston pairing of Ivan and Derek McClintock. Semi final spots were filled by Peter Day and Michael Gallagher, Gortahork, and Daniel O’Kane and John Quinn, Ballylennon. Quarter finalists were Patsy Boyle and Peter McGee, Burtonport, Tanya Jacob and Lee Jacob, Ramelton, Sylvia Bell and Graham Bell, Raphoe Pres, and Jamie Glackin and PJ Gallagher, Burtonport.